Hazardous waste can be anything from household hazardous waste all the way to drum containers housing large amounts of chemicals. It is common for manufacturing facilities to use hazardous material in their operations; larger the operation the more hazardous materials waste being produced. A hazardous materials storage building will contain the waste or inventory in order to prevent a hazmat situation. 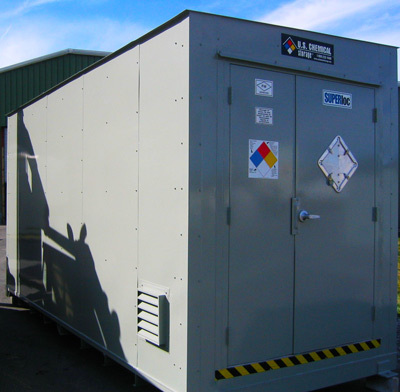 A hazardous storage building can prevent fires, explosions, and reactivity. There are many dangerous risks associated with hazardous material storage if stored improperly. To make sure that your chemical storage is stored properly and compliantly, proper maintenance is necessary. Before storing your hazardous material in your hazardous storage building, thorough research should be completed and chemical storage guidelines should be met. U.S. Chemical Storage manufactures the strongest and most dependable hazardous storage building in the industry. We offer the strongest and most secure solid steel construction that is hand-welded from heavy-gauge steel. You can be assured that your chemical storage will be completely maintained and fully compliant with our extremely strong hazardous storage building. When storing chemicals in your manufacturing facility U.S. Chemical Storage can help. We can tailor to any size hazardous storage building needed for the job. All of our chemical storage buildings are 100% fully customizable for your exact specifications. Keep your chemical storage safe and maintained, while keeping your personnel and facility safe. Our 15-year structural warranty gives you extra protection. Our buildings are guaranteed to define durability with our extremely strong chemical storage frame. We offer expert service for all of your chemical storage needs and provide you with maximum protection. We provide the highest quality hazardous storage building for all of your chemical storage needs.